I am a yoga practitioner, instructor, therapist and a passionate horsewoman. To me horses and yoga go together like syrup on pancakes. This may seem a strange combination but ask any yogi and rider and they will expound for hours on the similarities between the two disciplines. The same stillness and union I find in my yoga practice I feel when I ride. Before I ask anything from my equine partner I centre my self, physically and mentally. I need to be in a calm place here I can be sensitive to my partner’s actions and be receptive to his communication with me. Riding is a continuous 2-way dialogue between myself and my horse. When I practice yoga meditation or yoga postures (asanas) I also cultivate a sense of quietness. I move in and out of postures with a gentle breath and a calm mind. This translates into a feeling of being centred, the same feeling I have when I ride. I am passionate about riding and yoga because they have given me a freedom of movement I thought I was destined to lose. I have rheumatoid arthritis and my strength and range of movement have been compromised over time. A daily yoga practice has strengthened my muscles and joints and increased my overall health. Riding has enabled me to still enjoy the beauty of Costa Rica’s natural abundance. I can no longer hike but with my horse I can still enjoy the hills of Escazu with a partner who delights as much as I do in our early morning jaunts. The easiest way to explain this yoga/horse connection is to tell you my story. I began riding at the age of 30-something to keep my youngest daughter company. I was scared of horses and didn’t want my 7 year old daughter engaging in a dangerous activity without me right there beside her. Another reason was the steady deterioration of my joints due to rheumatoid arthritis. If I could no longer run and hike I could still mount my horse and trail ride the hills surrounding our home. Lastly, I was looking for a connection to nature and to the world around me. I began a daily yoga practice for the same reasons above: to keep that same daughter company as she earned her yoga certification, to come to terms with the physical and emotional consequences of RA and to help others with similar challenges and to find a connection to nature and the world around me. I found peace and harmony, wonder and acceptance on and off the matt and on and off my horse. In yoga to truly be a practitioner one must study the human body and the human spirit. Our studies guide us to inner awareness that is unique to each one of us. As we develop that awareness our yoga practice deepens. Yoga taught me to accept my physical limitations and to be grateful for the physical life I have. I am at peace with my body, no longer trying to dominate and subdue it. I have found the connection I was looking for. It is the love that is all around us, we only have to be open to seeing it. That is the wonder. It is the same in riding. We cannot force our will on our horse. We invite him to move in harmony with us and in that harmony is the wonder and peace. Every time you groom your horse, share a ride and spend time with your horse is a moment of grace, of yoga, of perfect union. This union has to be earned. We must make the effort to understand the true nature of the horse. When we understand the physical anatomy and physiology of our horse, when we understand the natural instincts that govern our horse’s behaviour, we can begin to have a meaningful dialogue with him. Our 2-way communication develops based on truth and empathy. And in that interaction we experience the wonder. Muscle mechanics are the same for humans and horses. Both humans and horses have the capacity to perform great feats of strength and agility. Muscles are remarkably adaptable as they can grow in strength and increase their elasticity. There is a simple law governing muscle movement: as one muscle group flexes, or contracts the opposing muscle group extends or stretches. You cannot have one without the other. In a standing forward fold the front quadriceps muscles flex or contract. The natural reaction of the hamstrings in the back of the leg is to extend or stretch. Along the back the long spinal muscles extend from the neck to the lumbar region at the same time the abdominal muscles shorten. This stretching and contraction not only promotes increased flexibility it also helps to develop muscle strength and balance. An added bonus is increased blood circulation and increased body position awareness, or proprioception. When we first attempt a new yoga asana we may experience some emotional unease along with the physical discomfort. Our equine partners, similarly, may experience some physical discomfort if their muscles are not sufficiently strong or flexible enough for certain actions we ask of them. Horses also experience unease, fright and anxiety when asked to perform a new action or one they are not prepared to do. Our job as the rider is to listen to what our partner is telling us. When our horse does not readily submit to the bit it is not because he has a bad attitude. Most likely it is because he is experiencing pain in his back due to a shortened top-line. This problem could be due to under-developed abdominal muscles. He may have muscular pain in his pelvis which is only apparent when he tries to lower his neck. A horse can only use his body language to tell us where and when he feels pain. It is up to us to interrupt those messages correctly. Similarly when we are having a problem with a particular asana we should not rush to judgement and give up. Yoga teaches us to approach this new challenge with calm and loving acceptance. As we learn more about how our body works from both the western and ayurveda perspective, we learn to listen more closely to the messages our bodies are telling us. We learn how to respond to those messages. We learn how to be present in the moment and to calm our fears. At the same time we learn how to invite our bodies to assume asanas with ease and love. By developing a deeper awareness and stillness in ourselves, coupled with knowledge about equine physiology and behaviour, we can better read the signals our horse conveys to us. 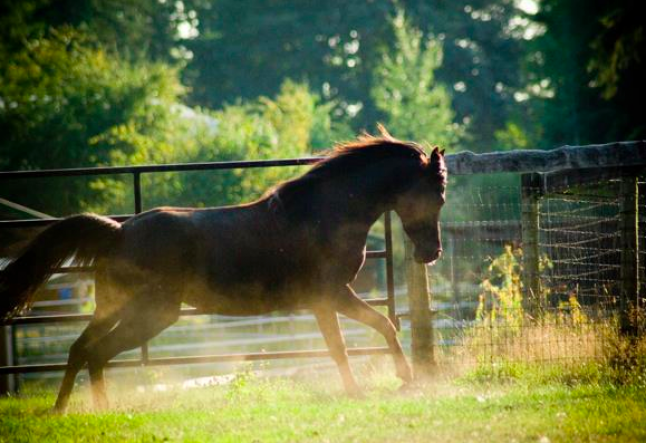 All riders know this truth: horses want to give you their loyalty. It is up to us to be worthy of it. The practice and study of yoga prepares us for that responsibility and joy. In my mind yoga and horses are the perfect combination. Both develop strength in body and mind and invite us to develop inner awareness. Both are really fun to do! Both invite you to find your quiet place inside of you. Both ask you to delve deeper into your inner awareness and intuition. Both ask you to be courageous in your quest for union and harmony.